Gold is a metal that is chemically inactive and does not corrode, but nanoporous gold (NPG), with its sponge-like structures, acts as a catalyst to promote chemical reactions such as carbon monoxide (CO) oxidation. Its mechanisms, however, remained unclear. Osaka University scientists elucidated the activation mechanism of NPG catalysts that made poisonous CO gas harmless. Their research results were published in Nature Communications. The researchers performed in situ analysis using atomic-scale resolution environmental transmission electron microscopy (ETEM) equipped with a high-speed camera, clarifying the catalytically active structure of NPG in low-temperature CO oxidation. They succeeded in visualizing self-activation on the surface of a nanostructured catalyst. ETEM observation and computer simulations revealed that this nanostructure contained residual impurities, which played an important role in catalyzing chemical reactions. 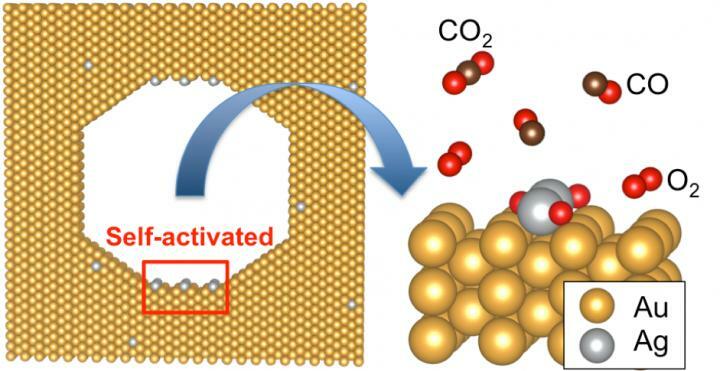 Lead author Naoto Kamiuchi said, "The results of our study will provide a clue to the clarification of reaction mechanisms of various solid catalysts used for industrial purposes, leading to the development of new highly active catalysts necessary for solving energy issues.